Mobilizing investments by institutional investors, foreign and domestic, is a requisite for India to meet its clean energy targets. However, this momentum needs to be accelerated to achieve its ambitious clean energy targets, which include 175 gigawatt (GW) of installed renewable energy by 2022, 40% of the total installed capacity to be renewable by 2030 and 30% of vehicles to be electric by 2030. One promising opportunity lies in institutional investment, both foreign and domestic, through pension funds, insurance companies and sovereign wealth funds. 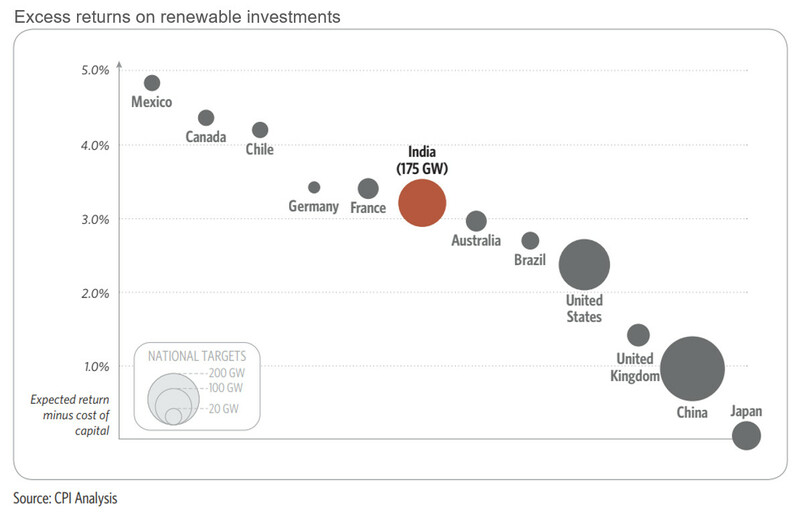 These investors mostly seek yield-generating investments in low-risk and long-duration assets which align well with the investment profile of renewable energy. Also, over the course of time, the needs of foreign investors have evolved from seeking small size, high-risk and high-return investments to large size, medium-risk and moderate return investments that are well-matched by the renewable sector offerings. However, certain sector-specific issues such as off-taker risk, limited availability of listed securities and low credit ratings of renewable energy securities restrict the flow of investments. In order to address these barriers, a recent report by Climate Policy Initiative offers potential solutions to stakeholders, including policymakers and regulators. The off-taker risk adds as much as 1.07% of additional risk premium to the cost of debt for renewable energy projects. A long-term solution is to fix the root causes, like the one being tried by the Ujwal DISCOM Assurance Yojana (UDAY). Though UDAY has shown promise in reducing operational inefficiencies and improving financial performance in selected cases, it is still early to measure the effectiveness of the scheme in reducing the off-take risk. Some other promising short-mid term options include tripartite agreements between the Central government, State governments and the Reserve Bank of India; and a credible payment security mechanism (PSM) either by the corresponding state governments or on a standalone basis. However, both the effected PSM and tripartite agreements are available only for public sector intermediaries – National Thermal Power Corporation (NTPC) and Solar Energy Corporation of India Ltd. (SECI) – between renewable power developers and state DISCOMs. There is need to extend these arrangements to producers who sell power directly to state DISCOMs, which ensures the most judicious use of the public capital employed. Another key reason for low investment levels from domestic institutional investors in the renewable energy sector is lack of investable securities (listed and liquid) since most developers are borrowing and not issuing securities. Indian policymakers have been aware of the need for these vehicles, and they have been gradually created, both for debt (green bonds and infrastructure debt funds) as well as equity (infrastructure investment trust) financial vehicles. However, green bond issuances (at corporate, not project level), no renewable energy specialized Infrastructure Debt Funds (IDFs), and Infrastructure Investment Trusts (InvITs) are indicators that investors are still trying to get comfortable with these vehicles. In this context, one potential solution is to incentivize banks and Non-Banking Financial Companies (NBFCs) like Indian Renewable Energy Development Agency (IREDA), to securitize their renewable energy project loan portfolio. The government can cover costs related to securitization of renewable energy loan pools (transaction cost) and subsidize partial guarantee fees on bonds issued through securitization structures. The third major barrier restricting the flow of investments is limited renewable securities with AA domestic rating – the minimum rating required by institutional investors to invest. Though there is a specific solution, in the form of a partial credit guarantee (PCG) offered by India Infrastructure Finance Company Limited (IIFCL), this is not considered successful yet, with only two renewable energy issuances so far, and those in 2016. One of the key issues with these credit-enhanced bonds is that though these are priced appropriately in the market, the net benefit compared to bank debt does not justify transaction costs. As an example, with PCG, the benefit is a maximum of 1.50%. With cost of PCG at least 0.5% and cost of transaction at least 0.5%, the net benefit of at most 0.5% does not justify the hassle of a bond issuance. Initial subsidization of guarantees and transaction fees may encourage issuers to actively pursue PCG-backed bonds in the renewable energy sector. Apart from addressing the aforementioned sector-specific barriers, there is a clear need for insurance regulators to introduce certain guidelines to insurance companies pertaining to climate risk management framework and carbon footprint disclosure. Introductions of such regulations will allow them to actively assess their portfolio exposure to sectors likely to be adversely affected by climate change in the coming year. This will give them a head start to gradually diversify their current investments from such high carbon sectors and ultimately accelerate finances into low carbon infrastructure sectors, including renewable energy sector. Another step in the right direction would be to mandate all companies to provide green ratings on their financial securities. These ratings will allow investors who evaluate environmental aspects in their investment decision-making to make more informed decisions around securities. To introduce such a mandate, the government can initially provide incentives to companies or rating agencies to introduce green ratings. In conclusion, there is an immediate need for policymakers to implement the aforementioned solutions in order to create an investment environment that lowers risk perceptions of investors in the renewable energy sector. These solutions complemented with evolving regulations and the disclosure landscape will be key to scale-up institutional investment in India.